Arizona Senator suggests Trump cancel his meeting with Russian President if he won't hold him "accountable" for aggression toward the U.S. 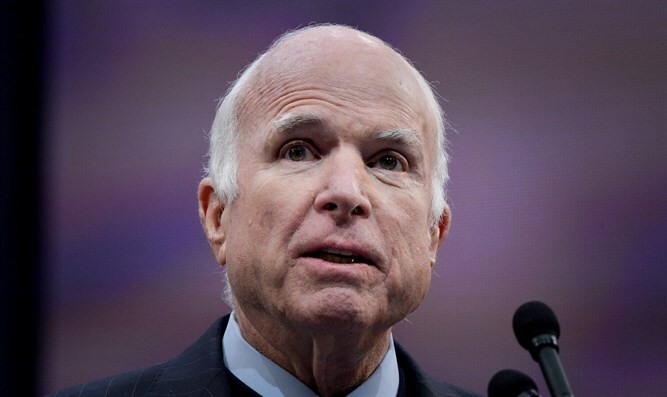 Senator John McCain (R-AZ) on Friday suggested that President Donald Trump should cancel his meeting next week with Russian President Vladimir Putin if he is not prepared to hold Putin "accountable" for aggression toward the U.S.
"President Trump must be willing to confront Putin from a position of strength and demonstrate that there will be a serious price to pay for his ongoing aggression towards the United States and democracies around the world. If President Trump is not prepared to hold Putin accountable, the summit in Helsinki should not move forward," McCain said in a statement quoted by The Hill. Trump and Putin are scheduled to meet in Helsinki next week. McCain’s statement came after Deputy Attorney General Rod Rosenstein announced that special counsel Robert Mueller has indicted 12 Russian intelligence officers in the 2016 hacking of the Democratic National Committee (DNC). Rosenstein told reporters that Trump had been briefed on the issue earlier this week and Trump on Friday, before Rosenstein's announcement, said he would raise the issue of election interference with Putin during their meeting. The indictments have sparked calls from top Democrats for Trump to cancel the meeting. McCain is the first Republican senator to specifically float that Trump cancel it in the wake of the indictment, though GOP Sen. Ben Sasse (R-NE) separately said the indictment reiterated that Moscow is not America's "buddy." McCain said Friday’s indictments were the latest in a "body of evidence confirming an extensive plot" by Putin's government to influence the election and "sow chaos and dissension" within America. "Despite repeated warnings from our nation’s top intelligence and military leaders, the Kremlin's efforts to weaken our institutions have continued unabated with insufficient action taken by the administration or Congress to strengthen our cyber defenses, safeguard our election systems, and deter further destabilizing activities," he said. McCain and Trump have a history of disagreements. While McCain backed Trump in the presidential election in 2016, he previously said he has serious concerns about Trump, backing former Republican nominee Mitt Romney in his criticism.